Sell with confidence at one of the UK's largest scrap gold buyers - ££Millions paid out so far! You are more than welcome to come in and sell your gold to us in person at our premises anytime from Monday to Friday 9am - 5pm. I sold my gold with CFYG and can promise you they are genuine. I sent it special delivery and the next morning at 9am they called to confirm the amount and the money was in my bank straight away. Excellent service!! Was really surprised with the amount offered!! I recommended to my friend who also was more than pleased. COMMUNICATION WAS EXCELLENT!! Get the best prices for your scrap jewellery in just 24hrs! Now paying £11.44 for 9ct Gold. We are proud to be able to offer the best cash for Gold prices in the UK. We can do this because we have over 25 years combined experience in the precious metals industry and we have developed a secure online system that keeps our overheads low and our scrap Gold price per gram high. Scrap Gold prices can vary enormously from company to company. We therefore recommend that you compare prices when you decide to sell Gold. Make sure that you compare prices in grams, some companies will try to confuse you by listing scrap Gold prices in Troy Ounces ( 1 Troy Ounce = 31.103 grams). You can check our latest Gold price per gram, as well as prices for Silver, Platinum and Palladium using the calculator. 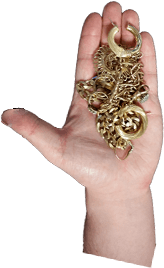 Our scrap Gold prices are adjusted every day to reflect the value of your scrap Gold relative to the fluctuations in the London Gold Fix price. If you are asking yourself 'Where should I cash my Gold?' then you already have the answer in front of you. Take a look at our latest "Compare Market Rates" table...Need we say more? When you decide to sell Gold you need to be sure that you are getting a fair price with no hidden extra charges. This is exactly what you receive when you sell your scrap gold to Cash For Your Gold. We guarantee that there are absolutely no additional commissions or refining fees whatsoever. We do make a small charge to cover our costs for processing your payment. This charge varies depending on the size and method of your payment and is clearly visible on the submission form when you select your preferred method of payment. Find the correct carat of your scrap Gold, silver or platinum and weigh it. We buy Gold of any purity starting from 9ct Gold. Use the online calculator to find out what your precious metals are worth to us. If you're happy with the estimated offer, fill out our simple sell Gold description form giving us the required information on the items you wish to sell. You can also benefit from our Cash My Gold price guarantee and ensure you get the best rate. If you can prove that our main competitors offered you a better rate we guarantee to beat it! Post scrap metals to Cash For Your Gold via Royal Mail Special Delivery (insured). Receive payment instantly via Cash, FPS or order a Cheque. 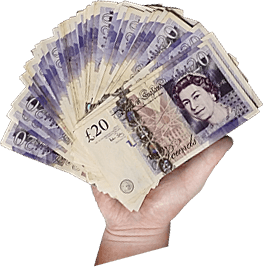 It has never been easier to sell your scrap Gold, scrap silver or scrap platinum for immediate CASH! Why We Can Offer Such A High Rate For Scrap Metals? Since we only buy scrap Gold, silver and platinum over the internet, our overheads are very low compared to high-street shops. In turn we can offer the best Gold price per gram for your unwanted precious metals. To find out our silver, platinum and scrap Gold prices refer to the calculators or have a look at our 9ct Gold price comparison table. CashForYourGold.co.uk is a part of Group International Ltd, one of the most dynamically expanding precious metals traders in the UK. With offices in Wolverhampton, we offer the highest level of customer service and satisfaction that our clients have come to expect from us with nearly 20 years industry experience and knowledge. Our friendly and knowledgeable staff are always happy to offer advice and assistance whether over the phone or at our premises.